← 3 Caps Youngsters: What to Expect, Sums or Bums? 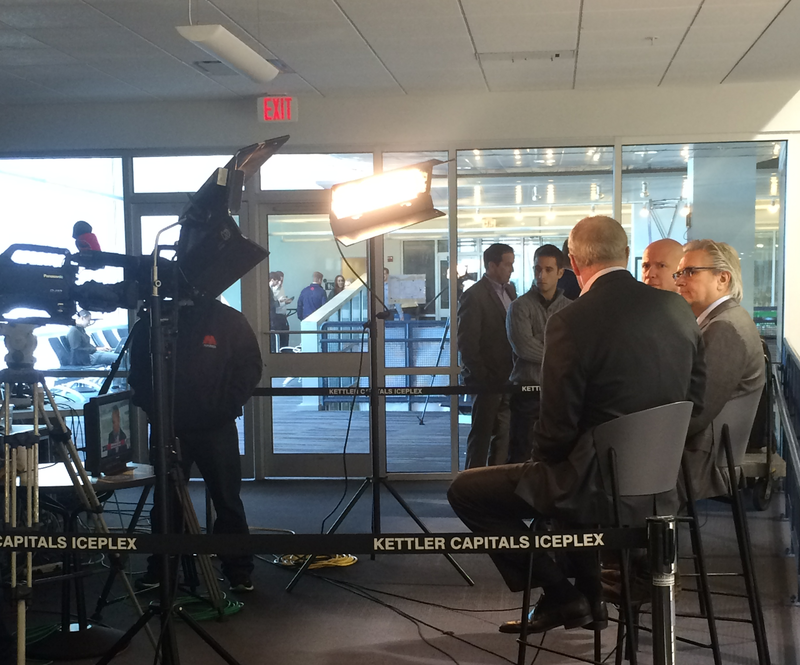 On Tuesday, the Washington Capitals organization hosted the annual Media Day luncheon at Kettler Capitals Iceplex, wherein distinguished members of the media, your stalwart scribblers and on-point on-air personalities, are invited to come have lunch and mingle amongst Capitals players and one another. Yes, the idea of an organization willingly inviting and feeding the very roaches and rats who metaphorically defecate upon them in public forums seems a bit counter-intuitive, a bit like Jesus washing Judas’ feet. But writers are poor and we are feeble, and Trojan horse or not, into their castle we came. 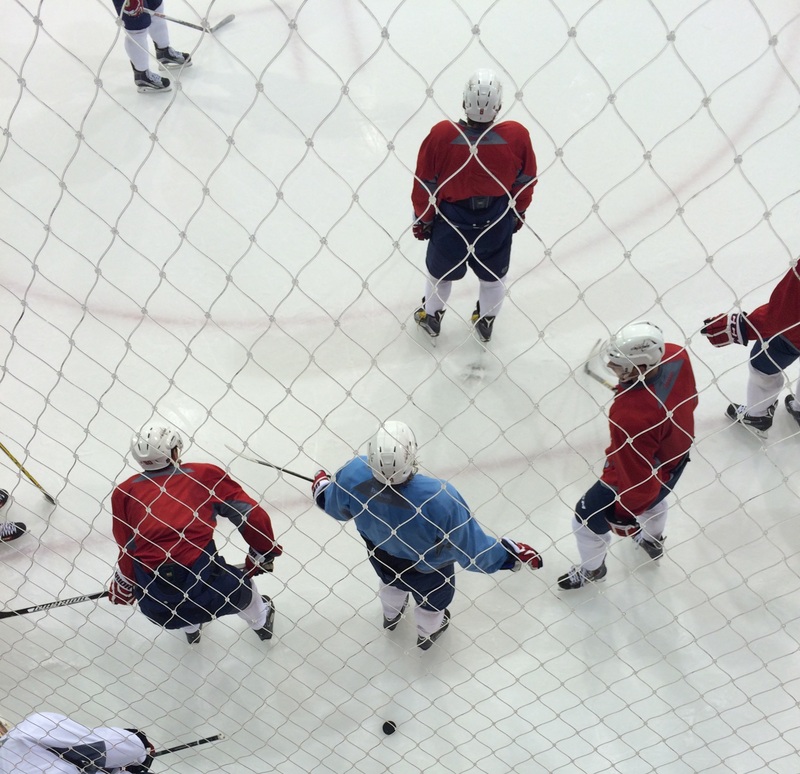 The Capitals approached the conclusion of their practice on the main rink when I arrived. Most formal drills had ended, and players milled about on the ice. Players cracked jokes. Russians hung out with Russians, Swedes with Swedes. Ashes to ashes, Björk to Björk. As practice ended, I made my way to the foot of the stairs, where a banner that said “MEDIA ONLY BEYOND THIS POINT” both blocked my way and stroked my ego. I ducked ungracefully around it. The upstairs mezzanine level – like the early morning hours of a 24-hour news channel – held a dozen small round tables. A small buffet was set up near the stairs, fantabulous potatoes and veggies and stews. The food service worker manning the hot trays dished out some insider gossip along with his incredible edibles. Media personalities whom I recognized from TV, the newspaper, and Twitter (2015 is weird) chatted in line with one another like so many plugged-in insiders, while I tried to find a height at which to hold my plate that looked natural. You see, I am a consummate loser. I knew no one, and I am as unplugged as an abacus made of balsa wood. I got my dollops of walnut salad and stewed foul and – yes – found an empty table and sat by myself. As I pondered my potatoes and the grim brevity of life, two older gentlemen sat down at my little six-seat table. We introduced ourselves – they were cameramen with local news channels – but they knew each other prior, and continued on with a conversation already in progress. I tried to keep up with their talk of lenses and rigs by stringing together alphanumeric nonsense (“Oh yeah, the NX240 is way sharper than the BM-6910!”), but the delicious food was my only salve. Olympic hero and NHL superstar, Oshie was asking me if he could sit with me, like I was the cool kid at school, and he was, well – me. “Yeah, sure,” I said. Nailed it. Oshie got his plate of food (complete with chocolate chip cookie) and sat down. One of the cameramen asked Oshie about college hockey. They talked Oshie’s alma mater the University of North Dakota, about how his team got beaten three years in a row in the Frozen Four by Boston College, and about fellow UND alumi in the NHL. I took this picture of TJ Oshie while he was talking. I asked him what it was like playing in the Olympics, about the event that turned the guy I was talking to into an international celebrity. Very tired but putting on a brave face, Oshie said, “The food was just okay. [Sochi] had a McDonald’s,” and smiled, remembering paradise lost. Indeed, some Olympians get luckier than others when it comes to the location of their Olympiad. “It wasn’t like Vancouver when guys could go up to Whistler [ski resort],” he laughed. I asked him what it was like to get the call that he’d been traded from St. Louis to Washington, that he needed to pack up his life and leave. “That’s how it goes,” he said. “It’s part of the job you signed up for.” Speaking of part of the job he signed up for, Oshie still sported the nasty black eye from his fight in the previous pre-season game. One of the cameramen asked him how it felt. “Oh, it’s fine,” Oshie winked. 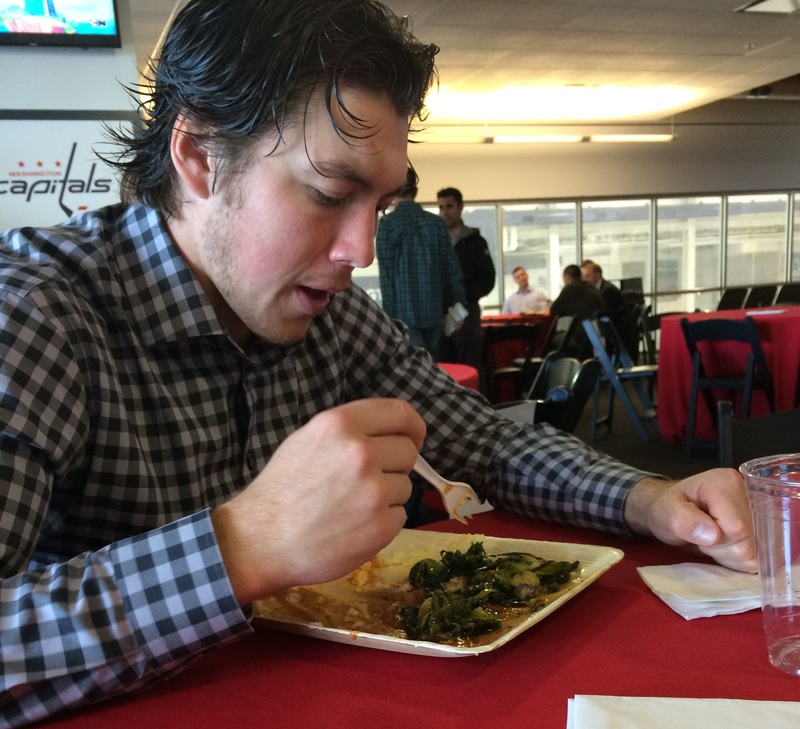 In this fashion, I passed 30-40 minutes eating lunch with TJ Oshie like we were cub scout friends chatting over spaghetti in a church basement. When I am old and gray and looking back on when the Capitals won six consecutive Stanley Cups from 2015 to 2021 with TJ Oshie, I will probably recall this as one of the more surreal experiences of my fledgling writing career. But, like a fine painting of some melting clocks, surreal is sometimes awesome. So, thanks to the Washington Capitals, and I promise, – I’ll go easier on you. This entry was posted in Washington Capitals and tagged Media, Offseason. Bookmark the permalink.